I have to laugh at this topic. I am sure you must already know what I am up to. At this very moment I have my USB drive plugged in, my document open, my massy bulk of printed manuscript sprawled at my side for reference, ready to begin this morning's session of editing-work. Oh, and, of course, I have my tea. 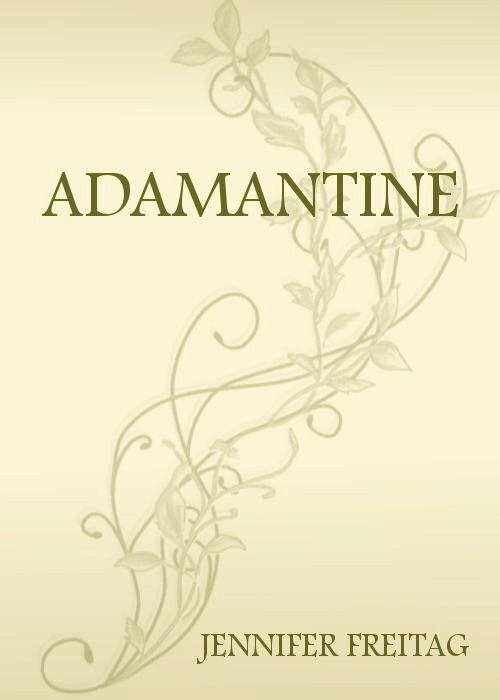 My current project, slogging through the editing stage, is the fantasy novel Adamantine, weighing in at the moment around 218,080 words. Being so very much bigger than The Shadow Things (which is 192 pages) she has given me a great deal more grief than my first novel, but, in a sense because of that, she has been that much more rewarding. What is Adamantine? Well, I have a page about it, and I don't want to be redundant (it grates on people's nerves, don't you know? ), but in summary I will say that it is a kind of sequel to Beowulf. There was not enough of the legendary heroes in the Old Poem to quench my thirst, so, as it is said, if there is a book you want to read and it hasn't been written yet, you have to write it. So I did. Beowulf was dead, but Wiglaf his heir wasn't - Wiglaf, who was bravery and loyalty itself. I wanted to know about him. But first there were fairies, and their empire which they had made; and there were savage cat-like barbarians living on the unenlightened outskirts of that empire; and there was Victorian England, and a young well-to-do orphan girl with some pluck and naivete. Things which did not seem to go together were being pulled together as I wrote and wrote and wrote; it seemed more as if I were merely following the single incongruous threads as they drew closer and closer together, as I grew closer and closer to the hand that was pulling them into a single cord. Inevitably I will be asked how long it took me to write Adamantine. The simple truth is that I don't know. You might as well as me what time I fell asleep: how am I supposed to know? I didn't keep track of the time and day when I sat down to write the opening scenes of a drab rainy day and a drab rainy fairy. I had no clear idea where I was going back then, nor what might come around the bend of the next chapter. All I knew was that something was unfolding in those deep dark secret places, and I had to get it down on paper. It has come a good long way since those early days (it has not been an easy way, either) and it has a distance to go yet. But it has been very rewarding. Despite the inevitable ups and downs and garbagey passages that had to be ripped out and ditched and rewritten, despite the despair and heartache, despite not knowing where to go next, I can sit back and look at the under-construction bulk of Adamantine and feel pride and excitement chasing each other widdershins inside of me. But they can usually be quenched with a good dash of editing. "I am not afraid of being overcome by the feeling. It will pass - and, no doubt, much sooner than it should." I can't wait to be able to show you the edited version. :P And it really is uncanny how well "The Never-Ending Road" fits Adamantine. I suspect...something. Some kind of conspiracy. Just blame it on somebody. Having not really much followed Adamantine's progress (In fact, I'm extremely jealous of those who have had the opportunity), I can only give you full props/kudos/apples-and-laud for sticking doggedly with it. I think my stitching is loose. I have heard of, but do not own and have not read Sutcliff's Beowulf Dragonslayer. I have mixed feelings about it. I don't have a problem with it, it's just that I have read Beowulf proper and it feels like cheating to go get a retelling of it. I think, "I'll get it for my children." And then I think, "What, no I won't. I'll read the real thing out loud to them." So I'm at an impasse. It's Sutcliff...but I have the real thing. Meh. I've determined to read Beowulf once every year. It isn't long, so it wouldn't be like Christopher Lee reading The Lord of the Rings once every year. If I did that I would read nothing else, and I would go mad. I am mad, what am I talking about? I thoroughly understand - and agree with - what you are saying. If Christa were my child, and I had her all to myself every day, I would not have used Sutcliff's simplification. But we only had three days to get through something, and I couldn't just send her home with the original to finish it: that's Not Christa - not yet, anyway. I was more concerned with finding something where we could dabble with slightly abstract concepts without venturing into, say, Aristotle. At least with Sutcliff, you know it won't be, like, a Golden Books about Beowulf. ('Grendel was angry. Beowulf had torn off his arm!' ... Any Child Still Listening And Not Bored Out Of Their Skulls: D'OH! No WAY!) I wanted something that would get her beyond Little House On The Prairie, and thought Sutcliff's tale looked just enough above her usual reading level to make her work without suffocating her in impossibilities. That probably makes very little sense. But this was a special case, and it worked for that. Oh goodness, I completely understand. I wouldn't have saddled Christa with the meaty mess of Beowulf either. I was...seventeen...when I first read it myself. So, for the problem at hand, I think Sutcliff's rendition is a good idea.